There is world’s most quietest room in U.S in which 99, 99% of sounds tend to be blocked. It is possible to listen to your own blood moving and also tummy gurgling in it. There is world’s most quietest room in U.S in which 99.99% of sounds tend to be blocked. It is possible to listen to your own blood moving and also tummy gurgling in it. It is a well known fact that today, the world is facing a haphazard noise pollution. Cities, because of industries and other factors, nowadays, can never be found in tranquility. There’s a room in the U.S in which 99.99% sounds tend to be blocked. It is possible to listen to your own blood moving and also tummy gurgling in it! 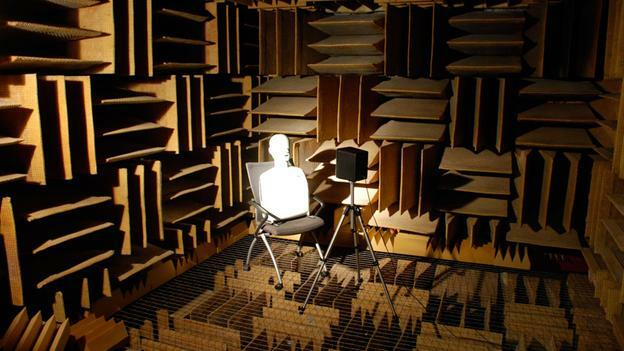 The ‘Anechoic Chamber‘ at the Orfield laboratories, in 2004, got booked in the Guinness Book of world records as the most silent place (room) on the Earth. It achieves its ultra-quietness by virtue of 3.3-foot-thick fiberglass acoustic wedges, double walls of insulated steel and foot-thick concrete. The room gives a background noise of -9 dBA. Whereas, the background noise of an average living room is 30 dBA. So you can imagine the level of silence. Now that we know, how much enormous is the amount of silence in the Anechoic chamber, so let’s study further on what this room is actually designed for. This chamber is used by a mass of manufacturers, which examine how loud or noisy their products are. This is also used to carry out studies regarding the sound of different things like, heart valves, the sound of the display of a cellphone, the sound of a switch on a car dashboard, and many more. Isn’t it astounding! How a small and silent room can give you such illusions that you can’t stay for more than 30 minutes inside it without a chair! Previous articleThe Inventor of Vaseline Claimed that He Ate a Spoonful of it Every Morning! Next articleTwins Start Deliberately Touching Each Other In The Womb At About 14 Weeks.